The YWCA is a place for learning and sharing between cultures and generations, responding to the needs and interests of women, girls and families. The schedule changes a few times a year offering various activities for a modest fee. Note that we offer programs, services and activities for families in the Peter-McGill neighborhood. The days that get longer make you want to get out of your hibernation? 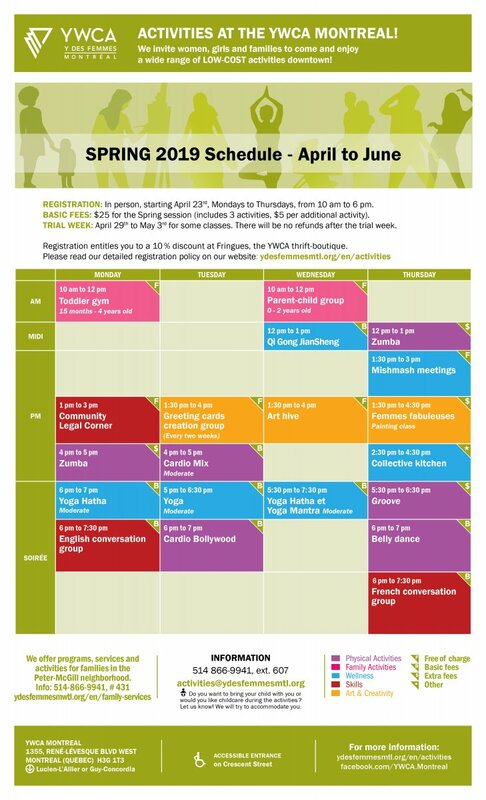 The YWCA knows how to help you get moving again… Here’s the schedule of activities for Spring Season 2019! Starting April 29th, enjoy low-cost activities that will drive you away from gray until summer solstice! Starting April 23rd, registration will be done in person only at the YWCA general reception, Monday to Thursday, from 10am to 6pm. The cost is $25 for the 2019 Spring session. This subscription fee includes 3 elective activities ($ 5 per additional activity). Several activities are totally free. 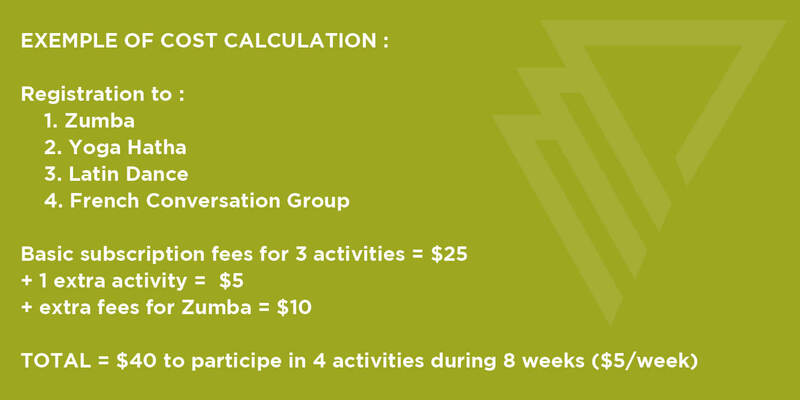 Zumba and Groove have an extra $10 fee each per session. There will be no refunds after the trial week (April 29th, to May 3rd). Registration entitles you to a 10 % discount at Fringues, the YWCA thrift-boutique. The YWCA makes it a point to offer accessible activities to women throughout the year. They include physical and well-being activities, family and creative activities, as well as opportunities to develop both your skills and your social networks. So take advantage of this great offer and spread the word!